Media Mention: Triangle Business Journal Reports on Plans for New Raleigh Office - Ward and Smith, P.A. On February 8, 2017, Jennifer Henderson of the Triangle Business Journal reported on Ward and Smith's planned move to the latest Highwoods building project in Raleigh. 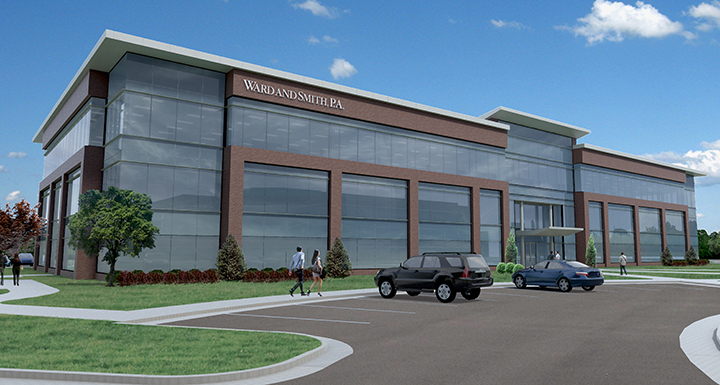 The firm expects to move into its new 33,000-square-foot space at 751 Corporate Center in late summer 2018, relocating from its current home at 5430 Wade Park Blvd., which is 24,000 square feet, according to Ken Wooten, co-managing director of Ward and Smith. "The new space will be better for us due to the efficient floor plate size. Our ability to design it from the 'ground-up' will allow us to plan for maximum efficiency, and keeps us on one floor," Wooten said in an email. "Our firm places a premium on collegiality and teamwork, so that proximity is important to us." Ward and Smith’s new top-floor space “will accommodate 50 attorneys and 50 support staff in anticipation of the firm's continued growth,” according to the firm. It said it will work with Alliance Architects on the design of the new space. The firm’s Raleigh office grew by nine attorneys in 2016 to a headcount of close to 30, according to Wooten. The growth included lateral hires in the following practice areas: real estate, white collar defense and litigation, trust and estates and intellectual property. You can read the full article with a TBJ subscription here and view the firm's press release about the project here.